I have been saving this Kalandia escapade from April 2 and now I have a follow-up story four days later to share as well. April 6, finally time for the grueling trip home to sleep in my own bed preferably with my own cat and husband, (with a nod to the Wampanoags and whatever other Native Americans we – as in white people, not my own personal zadie shvitzing in a sweat shop in Williamsburg – displaced hundreds of years ago). I have been plotting my escape, emailing everything that I would regret losing should it inexplicably “disappear” at Ben Gurion airport, (yes that does happen) or should the hard drive of my trusty computer suddenly develop a fatal error in the hands of the lovely 20 year old security officer, (yes that does happen too). My host debates whether I should get a bus from Ramallah or Kalandia (I am looking for a bus with yellow plates that can travel into East Jerusalem from occupied Palestine.) He decides it would be faster to get one at Kalandia checkpoint (my fave as you know) so we creep through the sardine can traffic, pull into the dusty parking lot, only to find that there are no busses here to Jerusalem. So…I need to schlep my two suitcases and backpack through the checkpoint and try my luck on the other side. I am wearing a scarf from Gaza to keep me calm and fierce and I am prepared: money belt off, hair clip off, I leave the watch and bracelet on because they were not the offending items last time, right? It turns out it is very challenging to wheel two full suitcases down the narrow metal corridor but it can be done, especially because Palestinians are so helpful. I get to the turnstile and (clever me) load each suitcase separately into the turnstile, push furiously until the bag plops on the other side and then do the next suitcase. I am feeling like wonder woman incarnate. Why hadn’t I thought of this, like ten years ago? At the next turnstile I ask the soldiers to open the door which they do, which by the way, is a lot easier and less humiliating for the schlepper. Then everything up on the x-ray machine and I saunter confidently through the metal detector. Beep-beep-beep. But I am feeling fierce and I am wearing a scarf from Gaza and just decide to ignore that alarm and stride confidently up to the window and aggressively shove my passport onto the bullet proof glass. The bored young man on the other side just waves me through!!!! Attitude is everything and of course it helps to be white with a face from the shtetle. I avoid the next turnstile by opening the adjacent door which is unlocked, (there is a goddess), but there is one more turnstile at the very end. An unhappy man and woman with six suitcases are waiting at the end pushing the button to open the door, but to no avail. I try the button,nada. I show them my suitcase/turnstile technique and then we start taking their suitcases (which are large and heavy) one by one through the turnstile. I find myself heaving furiously with all my weight against the metal bars, violently nudging each bulky bag to freedom. It takes three of us to accomplish this task and we are feeling quite victorious and unified in our micro struggle against the vast forces of occupation. I feel like a wild woman; this is my final act of defiance and power. Khalas. I am so done. I wander out into the sun and hear gun shots, no one seems to notice but me, but then I look up and see tear gas wafting above the wall. Ho hum, another day at Kalandia. I find the Jerusalem bus, get the suitcases loaded on, and sit down in front of a nice redheaded lady and her daughter who I soon find out are from Portland Oregon, now living in Germany. They have just been to Ramallah for the first time, “It wasn’t as bad as we expected,” so we start talking and my experiences in Gaza just pour out of me like I am going to explode. She listens intently and then says,” You know, but there are two sides to every story. If Hamas would just stop shelling southern Israel…” I resist an incredibly strong urge to punch her in her nice little nose, but take a deep breath and say more abruptly than I intended, it is much more complicated than that. I wrote a book on the topic, I suggest you read it. Like I said, khalas. And I am not even home yet. 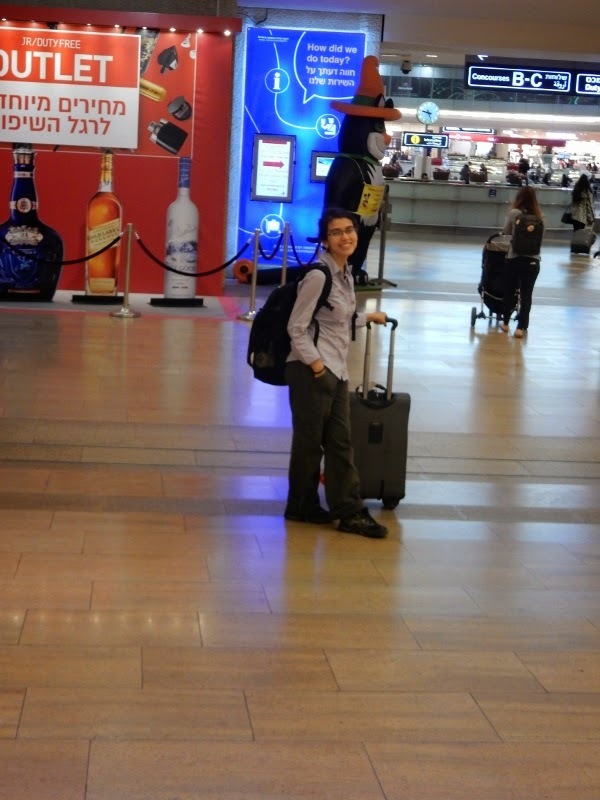 My colleague of the Traveling while Muslim variety and I arrive at Ben Gurion airport, take a deep breath, find our inner wonder women, and saunter into the airport smiling and laughing, carefree tourists coming home from the Holy Land after a quick stop in the Tel Aviv bubble (actually to have dinner with a very left wing activist who is working on a new organization called DE-COLONIZER shhhh). At the first security screen, there are two serious young Israelis, the usual identity-where are you coming from questions, I can honestly say Tel Aviv. My face is open and friendly, but I cannot control my annoyingly rapid, pounding heart. One of them explains very sternly “This is for your safety. If someone gave you something, they could blow up the plane.” Really? Shocking! It is hard for me to keep a straight face and I feel a little bit sorry for him. I bet his job satisfaction is really low. The other woman keeps apologizing for all the questions, “Anything sharp that could be used as a weapon?” I reply earnestly that I do have a nail clipper. She apologizes again and again, and I must give her credit. In the past few years the airport folks have called off the attack dog type screening and I must admit it is refreshing to hear an Israeli say “I’m sorry,” as I know how hard it is for them. Honest. I breeze though the first checkpoint, streaming wonder woman vibes all over the airport. Heart rate slows down. My colleague has a less, shall we say, breezy experience. The security guy asks her name, say your middle name, say your last name, where is your name from, origin of your name, (she answers smiling that her name is pretty international, it can be a Hebrew name, etc, that’s why her parents chose it), this drives him a bit crazy, but we are playing cat and mouse. Why are you here, where did you go, why Gaza, will you come back, did you have armed guards, (he asks this repeatedly and I realize that he cannot imagine being in Gaza without a full armed battalion or else we must be with Hamas, right? ), where did you stay, do they have hotels in Gaza, (really), did you have armed guards (again and again), parents name, (she asks which one, mom or dad?) When he hears her father’s name is Mohammed, he actually says: “Oh now I understand.” Bingo! So it seems they are not actually asking if you are a Muslim, but they are using all the usual racial profiling techniques to extract that bit of information. Having established that she is indeed a (dangerous) Muslim American physician who has done humanitarian aid, he asks where did you volunteer, she responds: Everywhere. Where? It’s a long list. But where in the Middle East? She starts listing countries: Sudan, Nepal, Bosnia, Iraq, and he says okay. He asks her what kind of work she does and she responds that she is a pediatrician and a Fulbright Scholar. (Soldier man, she is a FULBRIGHT SCHOLAR! Get that? And what exactly do you do for a living???) But I keep quiet and smile. I am a nice Jewish doctor traveling with a nice Muslim doctor and we are peace loving friends. Back to: how long has she known me? We were on the same delegation. Who do you work for, (over and over), how do you know each other. Interestingly, she clearly indicates that she and I traveled together to Gaza, but they never come back to re-interrogate me probably because of the iron domed protection of my last name: Rothchild. The Baron Rothschild bought a big chunk of historic Palestine pre ‘48, really. Not my family, but check it out. Our bags are tagged with a blue strip, not sure that is a good thing. Then we get on line for our plane tickets. Eesy Peesy. Next is the physical security screen, our bags are x-rayed, (FYI I just want the record to show that we both have TSA pre-check which is a pretty meaningless blessing here.) My colleague is immediately pulled aside, told to go to a different place, chastised that she went to the wrong place first. She is placed in a separate containment area with three to five security guards, it is semi-open with a partial wall. She is questioned with a repeat of the previous interrogation. This time when she lists where she has done humanitarian aid, she gets to include Afghanistan and Pakistan. She is asked if she is carrying bombs. (Really.) She is told to take everything out of her suit case, all electronics, batteries, over and over again: empty your pockets. (They do not find her other passport with stamps from all the forbidden countries slipped within a pack of sanitary pads, small victory and great place to hide stuff, just saying ladies). She is aggressively patted down by a gloved woman with special attention to her arms and legs, her shoes are off, she is x-rayed and her bags are x-rayed for a second time. Everything is wanded and I mean the inside of her camera where the battery sits, every book, all her papers, the inside of her computer. They take her computer, say that they are putting it through the x-ray, (again? )whatever it is, it is now out of sight so anything can happen. They wand all her audio material, all the wires, sim cards, all her medications. After all of her carefully backed belongings are piled in a jumble, they say you can clean this up now. She reminds them that they have not returned her computer which they finally do. Through this 30 minute interrogation, she remains “super nice and cooperative.” The computer is finally returned, insha’allah. Who knows what the Israeli forces or the Shin Bet or for that matter the NSA has done to it. So, dear reader, is this about Israeli security or Israeli intimidation and racial profiling and surveillance? I am pulled aside and wanded in a public area just beyond security. After I wait, pacing back and forth, my colleague emerges and we get on line for passport control, the final hurdle. The blond woman in the box is chatting loudly in Hebrew on the phone, barely looks at our papers, her stamp bonks on our passports, and we are in the international area. Free at last. But I am not done with you quite yet. In another ahistorical reference: the Aleppo Pine is described as “one of the common trees in Israel. It is quite rare in nature, but due to its quick growth it is frequently planted in forests. It is an extremely inflammable tree [do they mean flammable?] and consequently problematic.” Think Jewish National Fund forests planted over destroyed Palestinian villages. Think the massive forest fires in the Galilee a few years ago. Think big problem. Which brings me to the Common Date Palm: “The date is one of the Four and Seven Species in Jewish tradition…The date palm has turned into an important crop in the Arava, the Dead Sea Region and the Jordan Valley.” A quick glance at Wikipedia (my seven years of Hebrew school missed a few critical items) informs me that the Seven Species (Hebrew: ???? ?????? ?, Shiv’at HaMinim) are the seven agricultural products, two grains and five fruits, that are listed in the Deuteronomy 8:8 as being special products of the Land of Israel, back when God was getting everything figured out. The seven species listed are wheat, barley, grape (wine), fig,pomegranates, olive (oil), and date (honey). The unconscious message, of course, is that in the last few thousand years since God did his figuring, no one (and I mean no Assyrians, Babylonians, Romans, Crusaders, Ottomans, and a host of other colonizers and locals), loved these seven species as much as the Jews. Right? 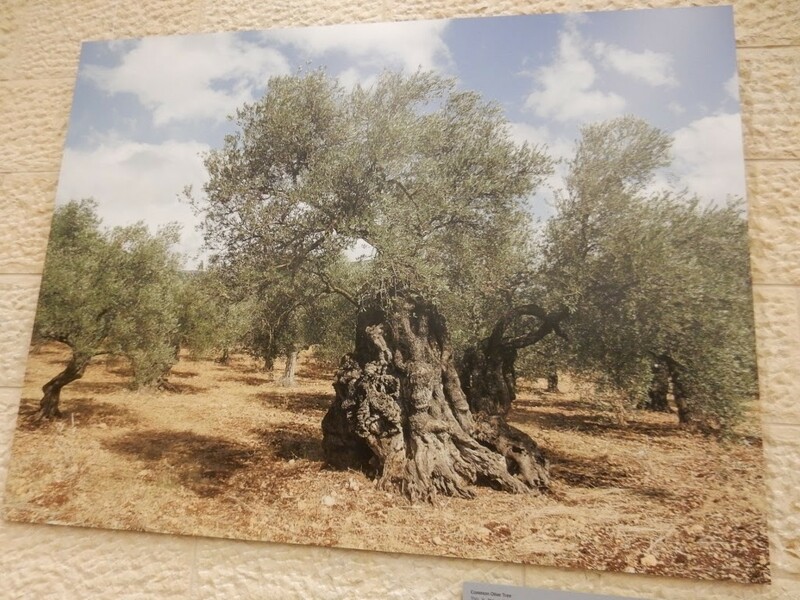 Forget that Palestinian families often name their beloved olive trees and revere them as much as their children. In the chutzpah department I think the awards go to the Prickly Pear which “serves as a live fence, for marking fields, and as an edible fruit,” these “live fences” mark the borders of pre-Nakba Palestinian homes all over Israel, and especially in the middle of JNF forests. And second prize to Citrus: “The citrus trees symbolize Israeli and Mediterranean agriculture. They were brought to the country by Arab in olden times and the coastal plain –especially Jaffa – became a world citrus growing center.” So: brief translation, the Arabs were growing their Jaffa oranges and involved in a major export business until 1948 when the Palestinian population was largely dispossessed of their land and fled for their lives if they were lucky and the Jews took over their citrus industry. Forgive my sarcasm, but I will just highlight the pertinent parts of the remainder of the exhibit before I have a seizure in the airport. “About the council for a beautiful Israel, The Council for a Beautiful Israel (CBI) is a public, nonprofit environmental and nongovernmental organization promoting quality of life in Israel through safe guarding the environment and the landscape’s aesthetic façade. It adopts a positive nonconfronting way of operating….through cooperation with governmental and private bodies from all sectors including the IDF…with emphasis on the more vulnerable parts of the population and the country’s periphery. Is it just me? I feel like I have taken some kind of hallucinogenic drug in the mind altering, history rewriting, hasbara department. We crash in the VIP lounge (thanks to my well-traveled dangerous Muslim friend with TCA pre-check) for a well-earned glass of wine. Ironically Norah Jones’ (full name Geetali Norah Jones Shankar), lyrical music wafts across the room. Her father is Ravi Shankir. Another dangerous non-Jewish brown-faced terrorist? But I am not quite done. As we wait on line to board the plane, an Israeli woman, curly hair, maybe early 50s, is arguing loudly with the stewardess, she does not want to dump out her water bottle. The woman keeps pouring out a bit and then arguing, pouring out a bit then arguing…. She is oblivious to the backup she is causing, the entitled edge to her voice, and the taunting ridiculousness of this public argument. See: Israeli, I’m sorry. So…I settle into my United Airlines seat, adjust the head rest, take a cleansing breath and decide to wait for takeoff by scanning a throwaway magazine, United Hemispheres, April 15 edition. How dangerous could a puff piece be? I am looking for something entertaining and hopefully meaningless, I am tired and I am done with all this political detective work. An article catches my attention, “The World’s Next Great Cities,” and sure enough after Rotterdam, Houston, Bogota, and Fukuoka, there is Tel Aviv, pop. 404,000, “The Next Great Tech Hub.” The article gushes with comments like: “And now, Tel Aviv boasts Silicon Wadi (that’s Arabic for ‘gully’)” Forgive me, but I think Wadi actually means valley which has a less, well, third world ring to it. And such smoke and mirror historical magic tricks: “You might assume a country that’s home to such ancient stalwarts as the Western Wall and the Dome of the Rock would be stuck in the past, [God gave this to us, everyone wants it, Holocaust, Holocaust, every threat is existential and will be the next Holocaust, but who is stuck in the past???] but Israel has its eye firmly on the future…Youthful, fun-loving Tel Aviv – a ‘startup’ city itself, having been founded in 1909…[as a Jewish neighborhood north of the thriving city of Jaffa](It’s not difficult to see the logical progression from the communal culture of the kibbutz to the collaborative, open-plan workspaces of the modern high-tech sphere). [from the Bundist, back to the land, joint ownership, muscular and bronzed, to…Google?] Where do I begin?